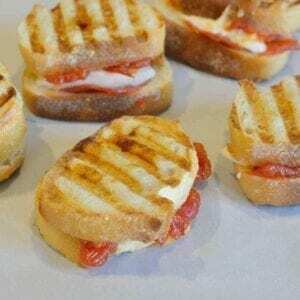 Cheesy Pizza Sandwiches are mini, slider-size gourmet cheese sandwiches with mozzarella cheese, tomato jam and pepperoni. Kid friendly and great for parties! Recently I’ve been in the middle of a heated debate that has seriously touched a nerve for some folks and I get why, it is a very serious subject: grilled cheese. Gourmet grilled cheese, to be exact. Did you know that April is National Grilled Cheese month? Now… here is the real question: What defines a grilled cheese? D. Does it really matter? It is all delicious! The results might surprise you and some were very passionate about their answers. I encourage you to go check it out HERE. … does that make it classified as a panini now? What if I just used cheese and bread, still buttered, but used the press to get the crispy crust? Is it no longer a grilled cheese? 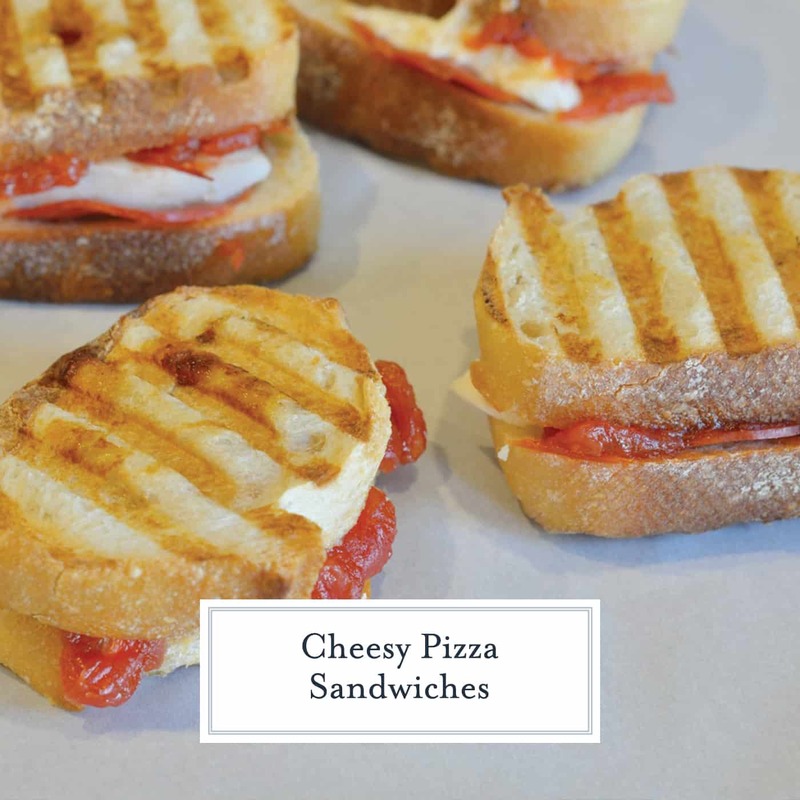 I opted to not name my tasty treats either panini or grilled cheese as to not further excite my readers and opted for what I believe to be a very benign name of: Cheesy Pizza Sandwiches (even though in my heart, I believe they are grilled cheese). 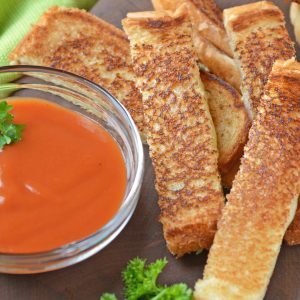 What makes my pizza grilled cheese sandwiches different? 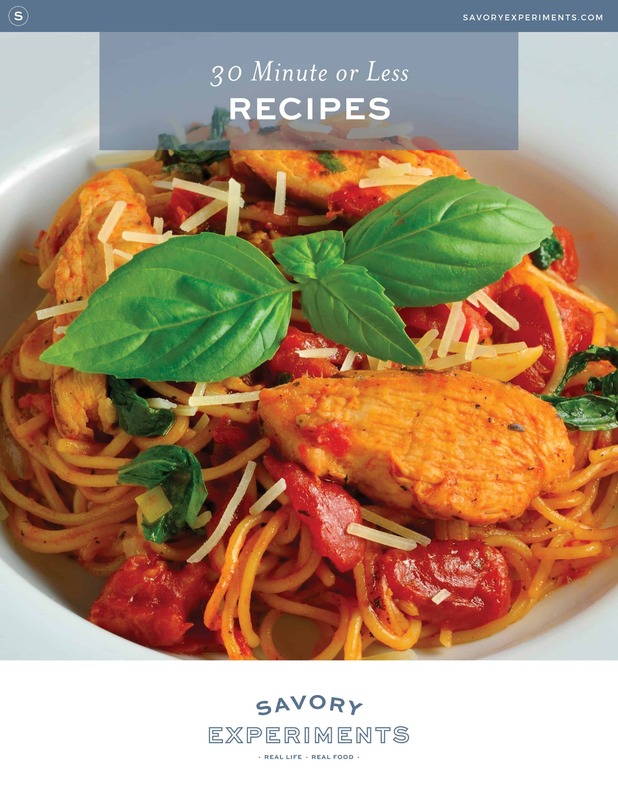 The main difference is that instead of using pizza sauce, I used my zesty tomato jam. It still taste like tomato, but with an edge that makes these bite-sized sandwiches the adult version. 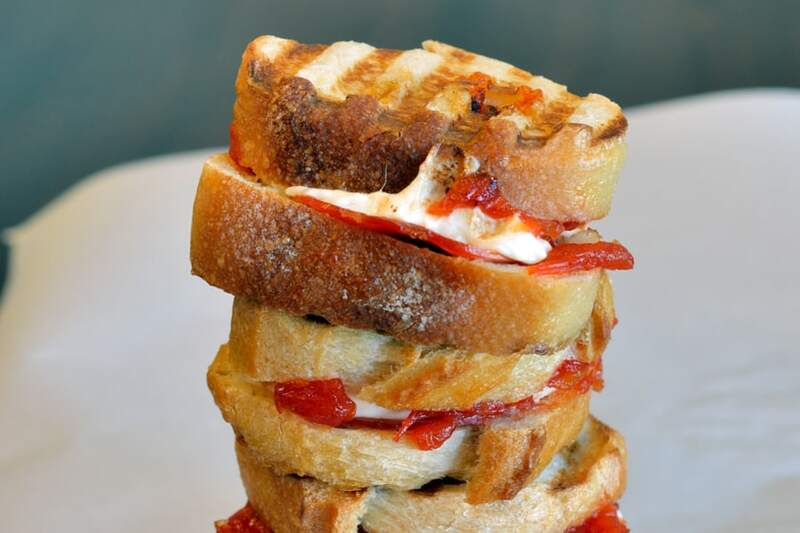 If you love gourmet grilled cheese sandwiches, here are a few more! Panini Press- Having this kitchen gadget makes any gourmet grilled cheese sandwich a snap! 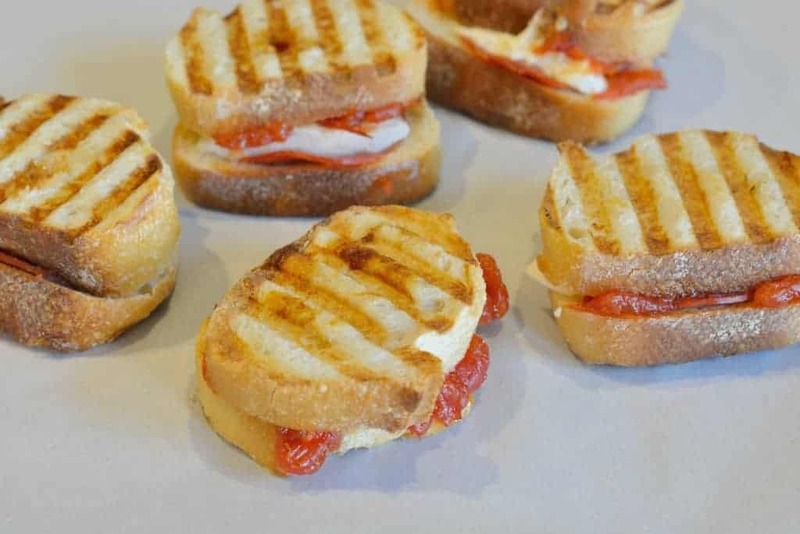 Cheesy Pizza Sandwiches are mini, slider-size grilled cheese sandwiches with mozzarella cheese, tomato jam and pepperoni. Kid friendly and great for parties! 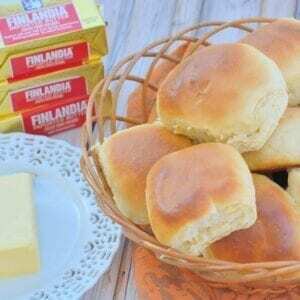 Butter one side of eat piece of bread. 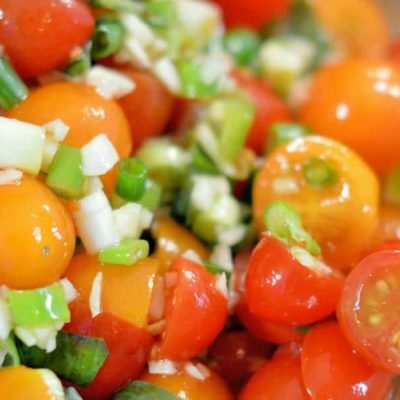 Equally divide and slather the opposite side of each piece with a small amount of tomato jam. On half of the pieces, pile one piece of turkey pepperoni and slice of mozzarella, topping with another slice of bread, buttered sides facing out. Heat panini press or large skillet. 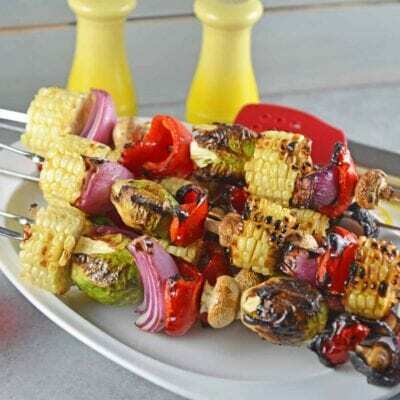 Arrange in a single layer and grill. If using a skillet, slip after 1-2 minutes or until bread is a buttery, golden brown. 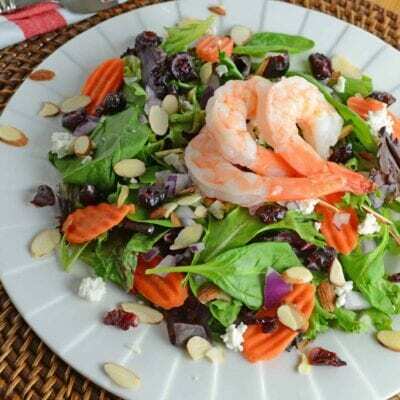 This looks like a perfect idea for lazy day weekend noshing. Love it! Ooh these look so good, love how customisable they are too! 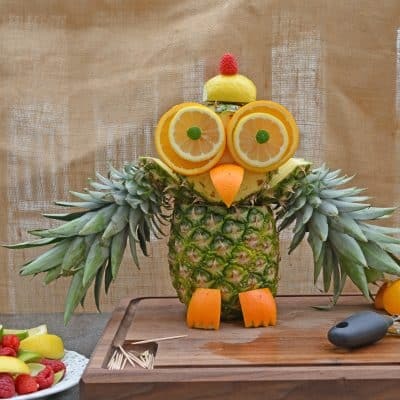 These are so cute and look fantastic! 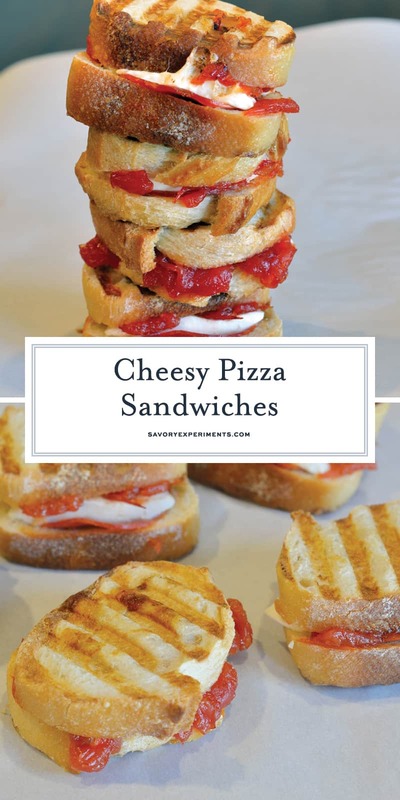 These pizza sandwiches sound really delicious, and so quick and easy too 🙂 Great idea!